This quilt is hanging sideways because it's too doggone LONG to take a picture of otherwise! Honestly, sometimes I just don't know what kind of madness overcomes me at times. I had bought this drop-dead gorgeous skulls-and-roses fabric quite a while ago without anything specific in mind, other than a pirate quilt for me. (I've been collecting piratey fabric from some time.) I did "sacrifice" some of this yardage to make youngest dear daughter a corset, so she could have a pirate corset, but I still had quite a bit leftover for me. Or so I thought. Perusing the vast Internet one day, I happened to stumble across a skull-and-roses Stack-n-Whack kit from (of all places) Overstock.com and boy did it look great. I looked that those pictures in astonishment and thought, "I can *so* do that myself!" and proceeded to sketch it out. Eventhough the Overstock.com samples were 8-pointed stars, because I had used part of the fabric for the previously-mentioned pirate corset, I only had enough fabric for 6 repeats. 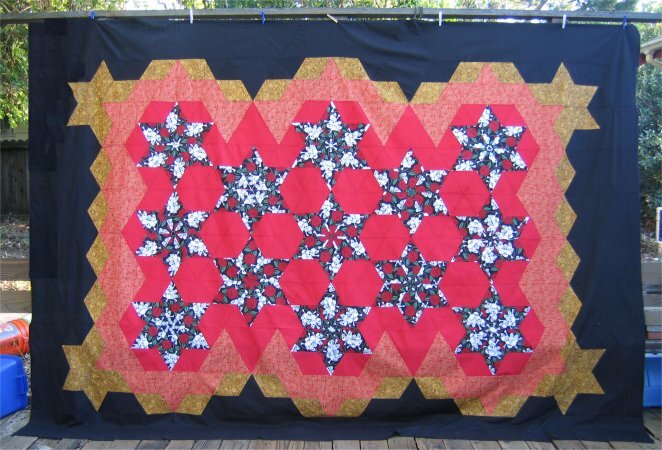 This meant that I could only do a 6-repeat motif; I decided to make a 6-pointed star block. I did NOT, NOT, NOT want to buy more fabric to make an 8-pointed star; the 6-pointed star with the fabric I had would be Good Enough. The scale of this fabric is pretty big (f you look at the Overstock.com fabric, you'll see that only a small part of the design is present in the star points). As I didn't want to lose the design elements, the 6-pointed star diamonds needed to be pretty large. Remember that statement ... it'll come back to haunt me. 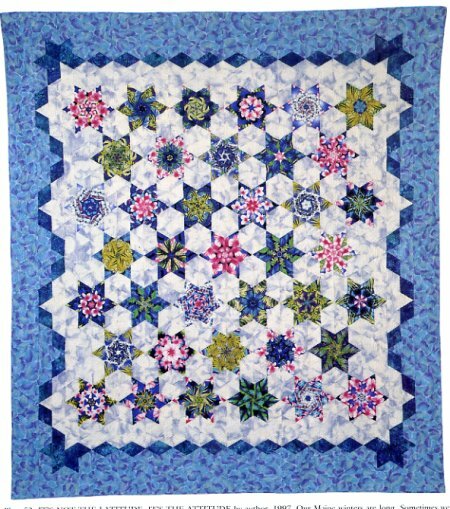 I also decided on a layout from Bethany Reynolds' original "Magic Stack-n-Whack Quilts" book, on page 84. I tend to like layouts that are unusual in some manner. Typically speaking, I try to avoid the standard grid-layout if I can find or think of something else. This layout of Bethany's is fantastically unusual, as it floats the stars inside an inner diamond border and finishes with an outer border. Once again, I thought to myself, "I can *so* do that!". Let it never be said that I don't lack confidence in my ability to do anything I set my mind to. (sub-title: pride goeth before a fall!) My version would just have fewer star blocks. A word about this layout: because the blocks are hexagons, if you were to sew the complete blocks and THEN piece them into a quilt, you would have a ton of set-in seams. Instead, Bethany has created a clever, clever assembly by making this quilt a vertical column quilt .. each column is one half of the star block. When you sew all the columns together, the stars are formed. In this manner, you avoid the set-in seams entirely. However, for this ease of assembly, the layout of each column is very, very important. Many of the quilt triangle blocks are subdivided into 3 smaller pieces; each of those smaller pieces are different fabrics, depending on where it falls. Since my own top wasn't following her layout exactly, I eventually drew a scale-sized drawing of the quilt and used colored pencils to show where each fabric was to be used. Without this drawing, assembling this quilt would have been very, very difficult. So, I stacked and whacked the fabric and sewed the stars. For my variation, I needed 13 star blocks. Well, I should have had 13 blocks because that's what the layout calls for. In fact, I *almost* had 13 blocks. I truly had 12 complete star blocks; the 13th was ... ummm ... kinda/sorta "short". I had the 6 points all right, but they weren't exactly the *full* diamonds. Because of the way the fabric was cut, the edge of the fabric wasn't exactly square and the fabric I needed for those diamonds .. ummm ... kinda/sorta wasn't there. The fabric was slightly narrower than it needed to be for a full diamond. After sewing the red background fabric to create the hexagon blocks for the 6-pointed star, I realized that this block is big. I mean BIG. As in really HUGE. Bigger than the state of Texas. 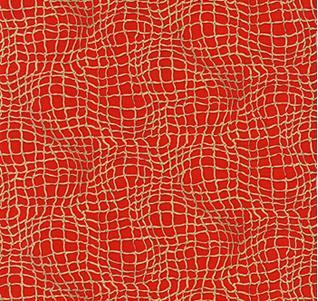 Like: 21"x24". And I have 13 of these blocks. Oy vey. But it gets *better*! Bethany layout calls for MORE to the quilt than just those ginormous 13 blocks. And about midway through working on the red background for the blocks, I realize that I am RUNNING OUT of the messload of red background fabric simply because the flippin' things are SO BIG. O.M.G. I have enough to finish the blocks, but not enough to also do the float background, which is between the blocks and the inner border design. Of course, there is NO WAY I can get anymore of this fabric and can't just throw in another red broadcloth cuz the dye lot, the texture & the look of the new fabric simply is never going to match the existing stuff. I can't even piece enough of the scraps together to create more humility blocks. O.M.G. The inner border of Bethany's layout is a very clever arrangment of diamonds. 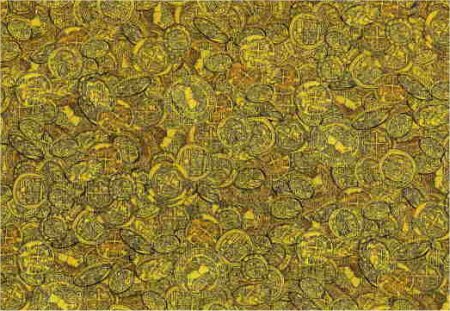 For this, I chose another of Pirate Cove line of fabrics ... gold coins, i.e. Pieces of Eight. With the float border, the inner border and the outer border more-or-less in place for the TOP HALF of the quilt *only*, this quilt exceeded my design wall, which is a twin-size flat sheet. There was still the lower half of the quilt to piece. Ummmm .... I think this quilt is much larger than I had anticipated. :-) And the story gets even *better*. I continued cutting the gold rope float border and the gold coin inner border and sewing the blocks together. I was getting pretty doggone near the end of my stash of the gold rope fabric and I was getting a tad nervous about running out. See, that is the *problem* with buying fabric without a specific quilt in mind ... how MUCH do you buy?? As much as I would love to buy the entire bolt, that just isn't practical. Besides, I'm sure Mr. Pirate would go beserk. :-) As fortune would have it, my luck ran out AGAIN along with the gold rope fabric. AAARRRGGGHHHHH! BUT ... as my girls know, I don't like problems .. I like solutions. Once again, some humility blocks were in the game plan. Luckily, these pieced blocks were even less noticeable than the skull-and-roses humility diamonds, simply because the overall print is so busy. Whew ... I sure dodged that bullet! This top now joins the other tops, to await its turn to be quilted.